In 1796 Thomas Malthus published An Essay on the Principle of Population in which he maintained that the population of the world increases geometrically with time while food supplies increase only arithmetically. Hence at some time in the future food supplies would be insufficient to sustain the world’s population, causing widespread famine. More recently, Paul Ehrlich’s book The Population Bomb (1968) predicted a forthcoming demographic disaster from overpopulation, and four years later the tract The Limits to Growth, issued by the Club of Rome, echoed the prediction of Ehrlich. 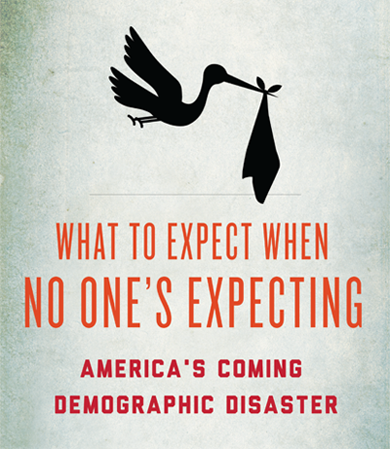 In contrast with these pessimistic predictions, the recent book by Jonathan Last demonstrates that the population of the world is actually declining at the present time as the average woman now has less than the replacement number of 2.1 children in her lifetime. Among other factors, the legalization of infant death through abortion has greatly lowered the birth rate. Thus, in a sense, Last’s book is just as pessimistic as the Malthusian ones mentioned above, but for a different reason. Last utilizes the demographic terminology total fertility rate (TFR) to compare birth rates, and on page 148 he quotes the present day TFR values in several European countries (all below 2.1) as follows: France (2.08), Ireland (2.01), the UK (1.91), Holland (1.78), Luxembourg (1.77), Denmark (1.74), Finland (1.73), Sweden (1.67), Spain (1.48), Germany and Hungary (1.41), Italy (1.40), and the Czech Republic (1.27). In America in 2011 native-born women had a TFR of 2.0 and foreign-born women had 2.6. The book states that no nation with a declining population has ever experienced prosperity. Then on page 160 we are informed that recovery is difficult for TFRs below 1.75, and has never occurred for a TFR below 1.50. The author recounts various steps taken by some countries to enhance their birth rates, mostly to no avail. Several causes are mentioned for the current decline in birth rates. Modern women, especially well-educated ones, are anxious to have careers so they postpone giving birth to get their careers going. Other factors involved are more time spent in the pursuit of education, delayed marriages, and increased divorce rates. Perhaps, however, the most incredible and the most discouraging factor is the high rate of abortion. For example, on page 60 we are informed that in 1983 there were 3,639,000 live births in America, and 1,575,000 deaths due to abortion. This means that, as a country, the US routinely kills 30.2 % of children before they are even born! This ongoing American Holocaust, this mindless slaughter of close to one-third of the next generation of our children, must be stopped. A dwindling population means that as time passes fewer and fewer young people are available to care for an expanding elderly population. Some of our standard social programs such as Social Security and Medicare were originally established under the assumption that they would be financially supported by continually growing numbers of young people. It is possible that the future era of declining birth rates will render care for the elderly through Medicare and Social Security financially unsustainable. Christianity, as well as some other faiths, possesses a strong missionary posture: namely the desire to spread the Faith throughout the whole world. The book states on pages 172 to 173, “religious women tend to have more children than non-religious women.” More specifically, it notes that “secular Americans have a TFR of just 1.66, compared with TFRs of 2.3 and 2.2 for observant Catholics and Protestants.” This is indeed good news on which we end this book review!